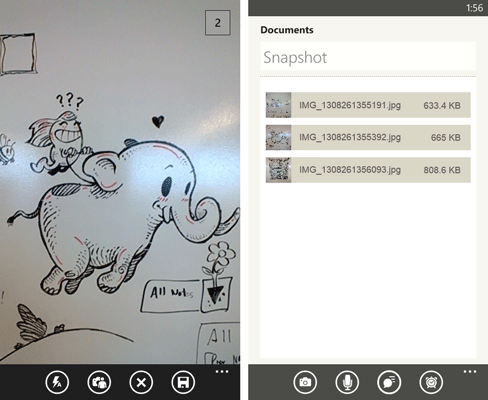 Evernote has added support for Windows Phone 8 today and Windows Phone users are getting improved features from the online note-taking service — including a new multi-shot camera, image slideshows, speech-to-text capabilities and auto note-titling. You can now take multiple snapshots per note without exiting the camera mode, a nifty feature for those who want to pack their notes with several photos. To complement this update, Evernote has also included slideshows — tap on a photo while looking at a note, and the image will pop out and let you swipe to view the other images. Evernote has also introduced a speech-to-text feature in its Windows Phone update. All you have to do is open a note and and tap the speech bubble icon, start talking, and Evernote will process what you said and transcribe it. Auto note-titling has also been included in the update, so you don’t end up with a bunch of untitled notes. Evernote will make use of details such as your location or the content of your note to provide a useful title.